There’s still time to make your reservations! When I think ‘travel‘ and ‘February’ how can the answer be anything but Mardi Gras in New Orleans? A costume for you, a costume for the pup and your off to the biggest party in the country on Fat Tuesday, February 16, 2010. New Orleans has so much to offer by way of pet-friendly restaurants, activities and hotels that whether you head to the big easy for Mardi Gras or any other time of the year your pet will be warmly welcomed with Southern hospitality and genuine excitement! Nibbling the kibble in New Orleans could take all day and night…there are so many outdoor dining venues that are pet-friendly that choosing just three a day is difficult. However, if they would let me, I’d go three times a day, seven days a week to Café Amelie in the French Quarter at 912 Royal Street (504) 412-8965. Cafe Amelie was absolutely my favorite find when Beau and I visited New Orleans. Located on Royal Street amidst the wonderful antique shops you will discover a dreamy courtyard with an ambiance that immediately transports you to France without the airport security and the long flight! The meal was divine and the service impeccable, but it was the enchanting atmosphere and twinkling white lights that stole my heart! The entire staff was kind and friendly to Beau, bringing him treats, biscuits, and a water bowl filled with water and ice! Make your reservation before you leave home so you are sure not to miss this wonderful restaurant. They also serve weekend brunch and weekday lunches which I can only imagine are spectacular! The other ‘not to be missed’ nibble has got to be Cafe Du Monde at the French Market, 800 Decatur Street. The original, the one you MUST visit while you are in New Orleans and really, I'm told, the ONLY place to experience New Orleans Beignets. What is a Beignet? A delightful French donut bathed, (drowning actually) in powdery confectioner’s sugar...Delectable! The Cafe Du Monde is outside, but the outside dining is so crowded they do not allow pets so instead, take your pet over to the take-out window and order your beignets (they come 3 to an order) and a cafe au lait, pay the nice lady and say, "Merci Beaucoup". Then sit on the benches in the adjacent courtyard and wonder why oh why donuts don't taste like this all over the country! "Bone" appetite! Fulton Street Dining and Entertainment, Fulton Street is a new complex next to Harrah's Hotel and is a pedestrian promenade currently featuring four outdoor, pet-friendly dining options; Ruth's Chris Steakhouse, Gordon Biersch, the Grand Isle, and Ernst Cafe as well as several pet-friendly shops and quite often you’ll find live jazz drifting down the street. There are two W Hotels in New Orleans but the one in the French Quarter at 316 Chartres Street (504) 581-1200 offers a little something extra special...beginning at dusk and open to the public, free and pet friendly, the W Hotel in the French Quarter hosts outdoor movie nights in their beautiful courtyard under the stars! Call to find out the dates, times, and movie schedule as it varies from month to month. You’ll also want to make time to take in one of the Horse Drawn Carriage Rides in the French Quarter lining Decatur Street at Jackson Square. There are dozens of pet-friendly carriage rides on Decatur Street at Jackson Square. Beau and I enjoyed a 30 minute carriage ride for a total of $25 for the both of us! Lots of fun and a great way to cover a lot of the Quarter in a little amount of time! When you are in New Orleans and with your pup you’ll be doing a lot of walking so for that reason I recommend finding a pet-friendly hotel right in the heart of the French Quarter. The W Hotel - French Quarter would be our first choice. The W has a fantastic pet-program chain wide offering a pet bed, food and water bowl, toy, treat and wide ranging hotel access policy for pets. In addition, this is the W Hotel with the pet-friendly movie nights, anywhere you can have a cosmopolitan and watch a free movie under the stars with your pup gets our vote! 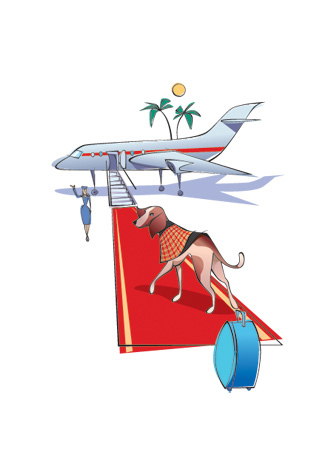 The W Hotel charges an additional fee of $100 per stay, which is non-refundable however, the W welcomes pet-guests of all sizes so bring the big dogs to the big easy and have a ball!